Concert inspired by London 2012 raises more than £300,000 to support aspiring British athletes hoping to compete at the Olympic or Paralympic Games. Holly becomes one of the first five SportsAid athletes to benefit from the fund after receiving a £2,000 cheque from Sir Elton John CBE at the event. Concert inspired by London 2012 raises more than £300,000 to support aspiring British athletes hoping to compete at the Olympic or Paralympic Games. Fred and Daryll are among the first five SportsAid athletes to benefit from the fund after receiving £2,000 cheques from Sir Elton John CBE at the event. Concert inspired by London 2012 raises more than £300,000 to support aspiring British athletes hoping to compete at the Olympic or Paralympic Games. James becomes one of the first five SportsAid athletes to benefit from the fund after receiving a £2,000 cheque from Sir Elton John CBE at the event. Concert inspired by London 2012 raises more than £300,000 to support aspiring British athletes hoping to compete at the Olympic or Paralympic Games. Molly becomes one of the first five SportsAid athletes to benefit from the fund after receiving a £2,000 cheque from Sir Elton John CBE at the event. 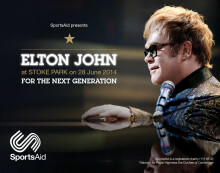 One lucky Elton John fan could win two free tickets to see him play live at a concert for SportsAid on June 28 just by liking the charity's Facebook page. Olympic gold medallists Anna Watkins, Dame Mary Peters, Duncan Goodhew, Heather Stanning, James Cracknell, Mark Hunter and Steve Williams and more will be attending SportsAid's Elton John concert on June 28. Tickets are still available from Ticketmaster for the event.